The first time I’ve been to Siargao, I was in awe how laid back the vibe and the people were. Also, I was surprised how much beauty it offers aside from its famous waves. The place left a mark in my heart and maybe that’s the reason why I keep on going back. It’s like a summer fling I want to experience again and again. In every visit, I can see big changes on the island, which for me is too fast. For example, I was in Siargao last November, then I’m back after 9 months. I saw a lot of establishments popped out around General Luna. They are like mushrooms. They are everywhere! Because I already did most of the activities on the island. I opted to explore more on the less touristy part of the island. I wanted to relax, sleep, eat, and then sleep again. Mostly, that was all I did. Good thing is, a friend was currently living on the island and we explored Siargao for a day with our motorbikes. Tip: You can rent a motorbike for only 350 per day. So here’s what we did and what happened. If you have been to Siargao Island, or not, you can pass by this area where you can see and overlooking vast area of coconut trees on your way to Magpopongko. Less people knew that you can walk down a few meters to a swamp. We went there with a local who is working on the road. They were very nice and helped us on our way. Unfortunately, it was low tide. It was a bit hard going to the part where there’s enough water for us to swim. Some tried to go there, but I didn’t. It was a muddy area without water. Nevertheless, it was nice knowing that there is something down there. Will be back and check it out during high tide. It was a nice day strolling around the island. Our next stop was another river where there’s a swing in a bent coconut tree. We parked our motorbikes near a bridge and we walked going to the area. There were tons of kids playing, swinging and jumping from the coconut tree. It was like a play ground and I can see that they were really having fun. Some went swimming, but I on the other hand didn’t. I kind of regret it, but I was on my period that time. I was planning to swim on the later part of the day. I was trying to avoid to look and smell like a dead fish. (Girls you get what I mean). My boyfriend, who likes talking with the locals were talking with the kids and didn’t go swimming as well. He was talking in Surigaonon, (my version) and trying to mix it with Siargao’s Surigaonon version. It was a bit funny. As of now, I heard that this spot is now popular, and the locals are now asking for a fee to take you to the coconut tree with a boat. I’m not sure if this is still what they are doing, but you have to check it yourself. Gina skating. Photo taken before we go down to the river. We stopped by at Tayangban Cave Pool. The entrance fee was a bit expensive for most of us, and besides some of us already came here so we did not go to the cave. Gina and Bella, two girls currently living in Siargao, brought their skateboards. In this area near Tayangban cave there is a slope. Since I was talking with my boyfriend, Hernan about a bird inside the cage. The next thing I saw was Gina was already on the road lying, laughing and crying all at once. I was shocked and confused what was happening. It turned out she was skateboarding down the slope and fell. She got big wounds both on her knees and on her one elbow. So, we continued our road trip despite the accident. Pretty strong woman, she still drove the motorbike with her wounds. The moment the accident happened, we asked the people in Tayangban cave if they have a first aid kit that we can use. They told us it is only for the cave’s visitors because they have only a few supplies. We were stopping and looking for a store with medical supplies but didn’t find any. This is one of the biggest problems on the island. They do not have a hospital nor enough pharmacies on the island to cater emergencies. Good thing was, the people in Pacifico were nice and gave our friend first aid kit. She was treating her wounds while we were siting at the beach, watching the people surfing the waves. Talking with the locals about the area since it was my first time in this side of the island. Locals knew that I am from a different part of Surigao with the way I talk. Some of my words were not completely the same as theirs plus my accent sounds different. After, we looked for a place where we can have our lunch. In our group, two were vegetarians so we needed to look for a place that can cater their food choices. We found a place where we were the only people around. We had the whole beach by ourselves. Even though the restaurant had a poor customer service attitude. The food was okay, so I’m okay. Haha. See the two plastic bottles? Those are Nipa Wine (Pauroy). Tuba is one of the common drink in the province, fewer people know about Pauroy. It is made of Nipa (Sani in Siargao). The first time I tried this one was last 2015 in Lanuza, a surfing place just an hour away from my hometown. We suggested to buy Pauroy for us to drink. It tasted like vodka, and it is strong. Really strong, but it tasted so good. When you visit Siargao, don’t forget to try this Nipa wine. You can ask the local where you can buy it, but if you’re in General Luna, you can find it in Harana Restaurant. During our road trip, we bought two litters of Pauroy. One bottle is mixed with herbs, and the one is pure wine. I think we bought too much because we did not finish everything. Perfect place to see the sunset. We ended our day relaxing under the palm trees in secret beach where we were waiting for the sunset. We spent the afternoon lying in the sand, and swimming. We explored the island for the whole day and I was tired from the whole trip so it was just a perfect way to end our day. Funny was, we were planning to drink all the Pauroy the same night but that plan never happened. I went to bed at 8PM, and I’m pretty sure they did too. Haha. This post might not be helpful because I didn’t put the exact address of each destination where we went. I leave that information for you to find out. Go and ask a local and explore the island. I encourage you to find simple paradise in every destination you travel. Not only Siargao, but also all other places that you will visit or already visited. Always remember that there will always be a place for you to discover. Have you been to Siargao? Share your experience with me and comment below. I’ve been planning to visit Siargao Island and enjoy all what it has to offer, but until now I haven’t been there. Hopefully soon If I get the chance. 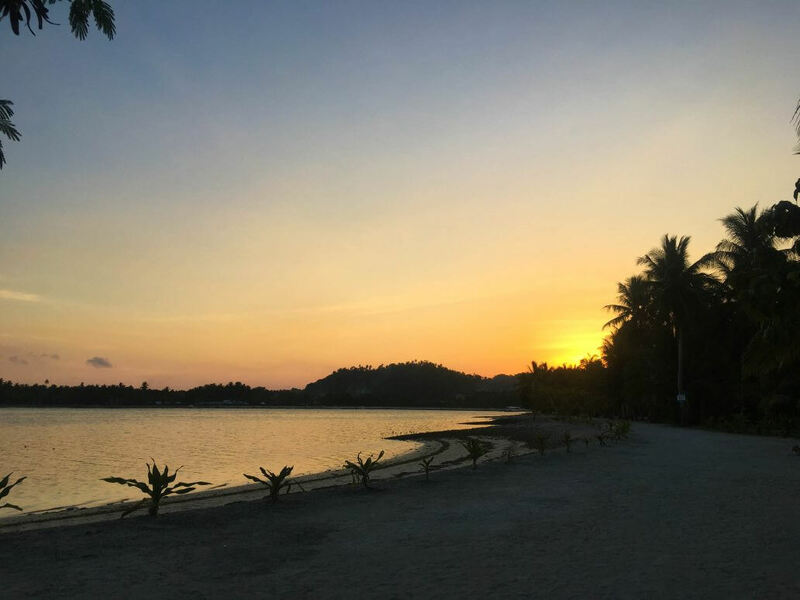 Thank you so much for sharing your beautiful experience on the Island of Siargao.